WorkFit-TL Sit-Stand Desktop Workstation T / TL. Keyboard moves in tandem with the worksurface. 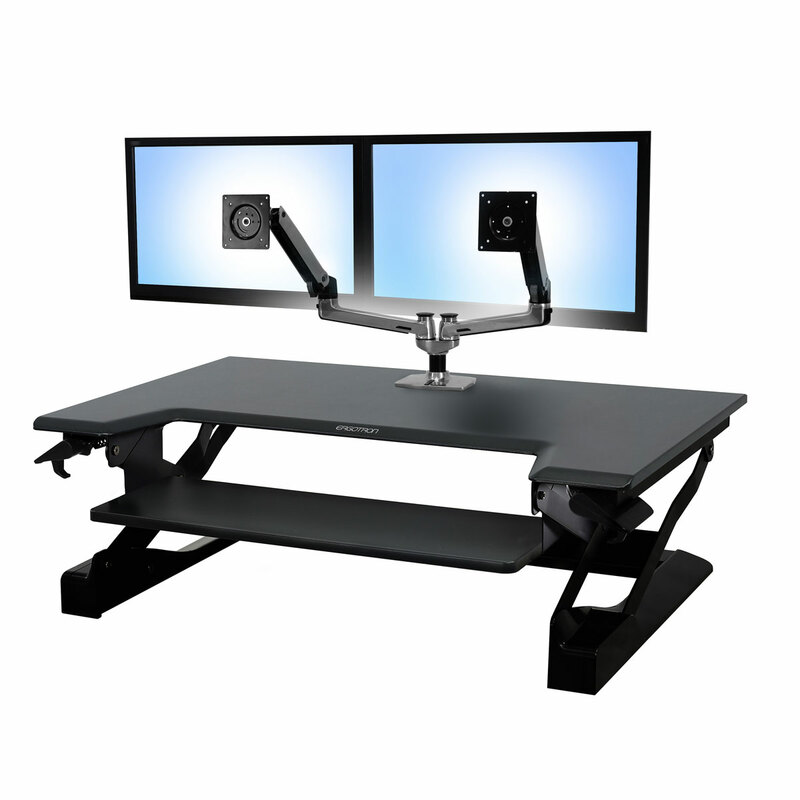 Displays can sit on the work surface or integrate with an Ergotron monitor mount kit. The Ergotron WorkFit offers an uncomplicated height-adjustable desk solution. No need to install additional electrical sockets for an electric desk. Just place the WorkFit on a desk surface and get to work. Arrives fully assembled for easy installation. Instantly switch between sitting and standing. Adapts to current office space. Why sit less and stand more? Sitting for long periods of time can be bad for your health. Too much sitting has an effect on our body’s metabolic system. Sedentary lifestyles raise the risk of cardiovascular disease, but most people don’t have time for exercise. On average we sit for almost 8 hours a day, while some people sit for up to 15 hours a day. Standing is the primary cure for sitting disease. It increases energy, burns calories, strengthens muscles, and improves posture. Even when all-day standing is not practical, sit-stand products allow you to do sit or stand whenever suits you. Narrator: When you think about it, it just doesn’t make sense. Technology allows us to be more mobile than ever before, yet we’re still so sedentary. Our tech gear, tablets and telephones are designed to set us free, but our work, home and school environments are tying us down. We know that sitting less and standing more is good for us. The question is: why isn’t more being done to support a happy, healthy, productive society? It’s time we all stand up for ourselves. After all, everybody wants to be healthier, don’t we? Dr David Dunstan: We move from the chair in the home to the chair in the car to the chair in the office to the chair back home. And people can spend up to nine, ten hours a day essentially sitting. When you make comparisons of people who sit for higher amounts versus those who sit for lower amounts, consistently you see higher rates of disease, etc., in the higher sitters. We’re starting to find that, it seems to have an impact on how people feel, and it seems to have an impact on their risk factors for chronic diseases. Frequent postural change appears to be the most beneficial for musculoskeletal health, metabolic health, and also brain health. Narrator: We all want more flexibility, more choices, more opportunities to exercise our options, am I right? Michael Mullen: Workplace transformation is here. In today’s world, you have a choice with existing technologies that are getting more and more mobile, more and more dynamic every day. To work where you want to work, how you want to work. Ergotron has been developing products to support optimizing the use of technology in the workplace for 30 years. Sitting standing, collaborating, meeting with other people, focused work, all of those require different postures, different social interactions. We are helping people be the best they can be in the jobs that they’re trying to get done. Narrator: And who doesn’t want to engage with each other more freely, more collaboratively in more meaningful and productive ways? That’s what I’m talking about. After all, isn’t that the point of all our hands-free, Internet-enabled, digital, wireless go-go out there and get ’em mobile technology? Millions are being invested in researching a better way to sit down. That’s crazy! There are studies galore that show how bad sitting is for us. I mean, it’s so bad. But we just keep sitting. That money is much better spent finding ways to make office, classroom and home environments more flexible, creative and playful. Dr Ellen Fisher: When interior designers design now, we think about flexibility. We think about designing spaces that have built-in adaptability to the future. And the furniture that’s within that space has to likewise be flexible, reconfigurable and adaptable to future needs. So, when we think about furniture, the idea of having a work surface that is also movable is really important. By designing spaces where people pass each other, meet each other, come together, encouraging movement, encouraging interaction, we create a more vibrant space that nurtures people, that makes them feel welcome, comfortable, secure, happy and healthy. Narrator: The numbers on this are kind of staggering. Studies show that standing up—even just a little bit more than we do every day—can make a huge difference in health outcomes and overall quality of life. Sit-stand solutions give people more choices and more versatility, which makes us happier, and more industrious. What’s really cool? These solutions support a dynamic, free-flowing environment, where collaboration thrives, new ideas emerge and life gets better. It’s time to take a stand. For your health, for your freedom of choice, for your sense of community and spirit of collaboration. Don’t just sit there, stand up! If every UK worker were 178cm tall, a universal desk height of 80cm might suit everyone. But in a world of many shapes and sizes, workers need an adjsutable desk to match their dimensions. We also need to be able to choose how to work. Not everyone wants to stay in the same position for 8 hours a day. Even if we did, when workers can move at their workstations they stay healthier and become more productive. The WorkFit-TL has a larger keyboard tray and work surface than the more compact WorkFit-T, yet both variations stay within the desktop area when they are raised and lowered. The WorkFit is stable while in motion and when locked in position—no need to worry about everything crashing to the floor should you decide to lean on it. You’ll hardly need it, but you can download one here.